Set the mood and focus of the occasion with dazzling light effects using Chauvet's Xpress 512, an interface powered lighting controller with DMX-512 USB support. The controller is truly dynamic as it is capable of connecting multiple interfaces for a robust lighting experience with more universe coverage. Fully compatible with Windows or Mac operating system, the controller is potent to play unlimited light shows when supported by a computer and can playback one show without a computer. The Neutrik® DMX connector provides excellent cable protection and retention whereas, the Mini-Din connectors extend comfortable external triggering for an uninterrupted lighting experience. The compact size and light weight construction makes it easy to be taken around in your backpack. 3.9" x 1.7" x 0.3"
DMX-512 USB interface. Playback unlimited shows with a computer and 1 show without a computer. Connect multiple interfaces for more universes. Compatible with Windows® and Mac OS X. Neutrik® DMX connector. Size: 4.3in x 3.2in x 1.5in. Power: USB. Set the mood and focus of the occasion with dazzling light effects using Chauvet's Xpress 512, an interface powered lighting controller with DMX-512 USB support. The controller is truly dynamic as it is capable of connecting multiple interfaces for a robust lighting experience with more universe coverage. Fully compatible with Windows or Mac operating system, the controller is potent to play unlimited light shows when supported by a computer and can playback one show without a computer. The Neutrik® DMX connector provides excellent cable protection and retention whereas, the Mini-Din connectors extend comfortable external triggering for an uninterrupted lighting experience. 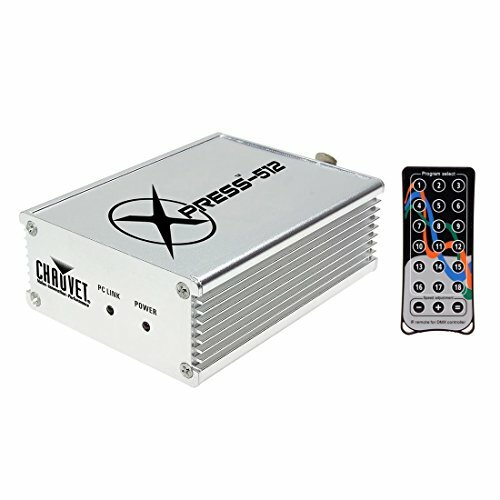 Wireless Infrared remote for Xpress-512 Plus interface. Instant access to pre-programmed light scenes. Quick and easy push-button operation. Manually adjust the speed time on-the-fly. Extremely compact and lightweight. Unobstructed distance: 20ft (6.1m). Power: 3V lithium battery (CR 2032). Dimensions: 3.9" x 1.7" x 0.3"